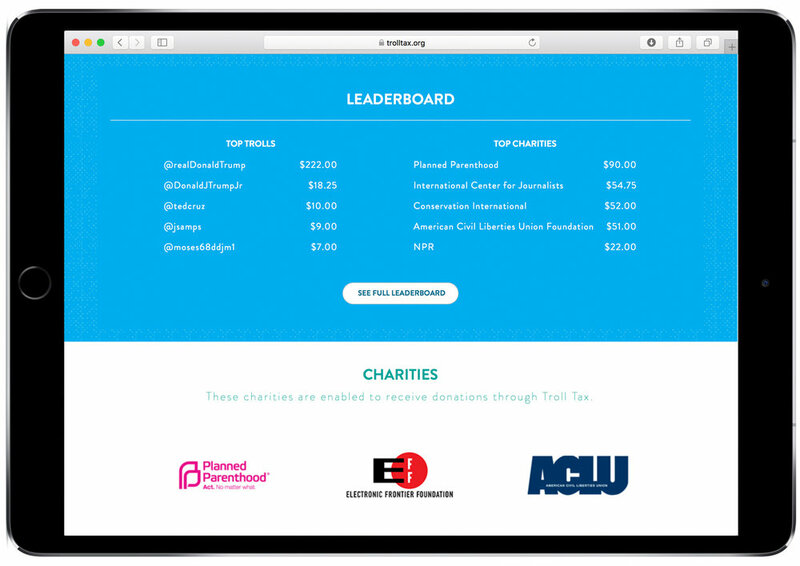 Troll Tax / A platform that transforms hateful tweets into donations toward social justice. Instead of engaging in pointless, emotionally draining arguments with trolls on Twitter, simply paste the URL of their tweets on the Troll Tax site (or Chrome Extension) and donate to one of several charities in their name. The perfect reply tweet is generated, tagging the troll, announcing publicly that their vitriol has elicited a donation. This reply tweet also links to a leaderboard that shows the troll’s Twitter handle and how much money has been raised from their online vitriol. Other users can add donations, effectively “feeding the troll” in the best way possible – with kindness.